CINCINNATI -- A tiara sits atop one of the Queen City's Downtown buildings, but Cincinnati's sweetheart lives in the zoo. Cincinnati Zoo and Botanical Garden's baby hippo, Fiona, has captured the hearts of thousands over the past year. She'll celebrate her first birthday Jan. 24, but her story -- with all its joys and struggles -- started a little bit before that date. Zookeepers paired her parents, 17-year-old Bibi and the late 34-year-old Henry, for the creation of the Cincinnati Zoo's Hippo Cove, which opened in July 2016. "Once Bibi and Henry got along, we knew we were pretty much set for a baby to come along," said Christina Gorsuch, curator of animals at the Cincinnati Zoo. 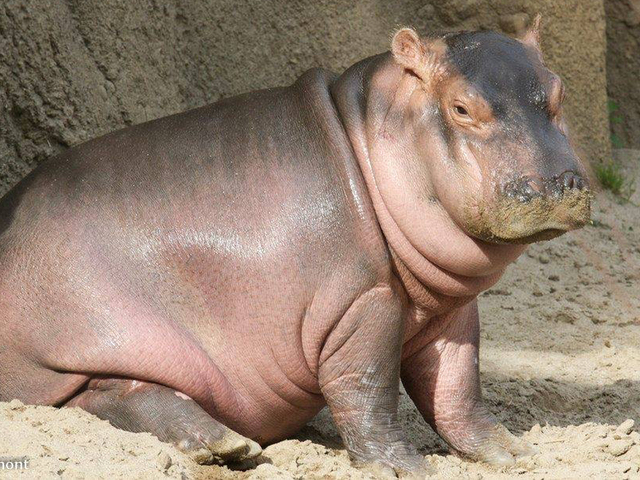 Zoo officials had to continually check to see if there was a hippo bun in the oven. Dr. Jessye Wojtusik of the zoo's Center for Conservation and Research of Endangered Wildlife led a team performing weekly ultrasounds starting in August 2016. Zookeepers received their first glimpse of Fiona via ultrasound in January. The pregnancy wasn't a big shock to caretakers, who knew the pair had been mating. "I mean, it was exciting, but at the same time hippos are really good at getting pregnant and having calves," Gorsuch said. More exciting was the fact that this was the first ever ultrasound image of a Nile hippo fetus. So Fiona was famous -- albeit only among zoo insiders -- before she was even born. "Just out of nowhere, clear as day, this tiny little spine and rib cage showed up, and we moved a little bit, and we saw this tiny little flickering heartbeat," said Wendy Rice, head keeper of the zoo's Africa department. Zoo officials didn't know how big to expect the fetus to be at any given stage. However, based on the timing of Bibi's and Henry's breeding and the eight-month gestation period of hippos, caretakers anticipated the baby in March. Less than a month after the ultrasound, Bibi began showing signs of labor. Caretakers observed her methodically rolling her body back and forth and holding her tail at odd angles. They grew concerned. "Those are all good indications of labor," Rice said. "A couple of months down the road, we would have been thrilled to see them, but as soon as we started seeing that behavior we started to panic." When the hippo keepers went home Jan. 23, several of them continued their watch via webcam. At about 3 a.m., zookeeper Dan Turoczi saw a webcam image of a baby hippo on the ground and rushed to the zoo. Any question of a miscalculated due date was dispelled when he saw Bibi's tiny baby. Newborn hippos usually weigh between 55 and 100 pounds. Because mother hippos are typically aggressive and protective of their babies, Turoczi cautiously considered his next steps in assisting the premature newborn. "I didn't want to do anything that would cause Bibi to come charging at me to protect her baby and accidentally injure Fiona in the process," he said. Bibi's uncharacteristic lack of maternal instinct might have helped save Fiona's life. Zookeepers were able to take Fiona to provide the care she needed. 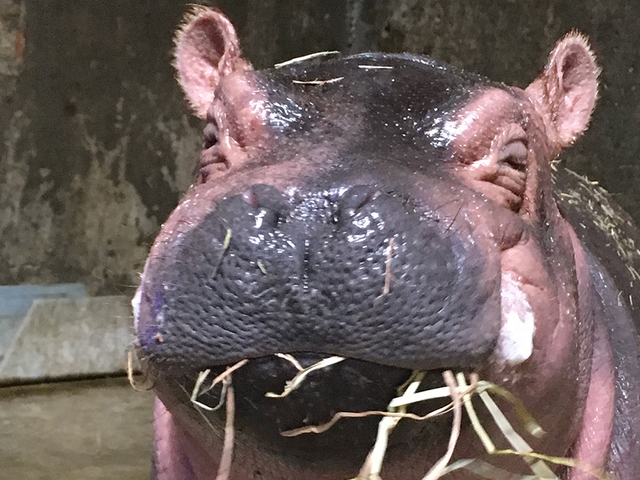 That care included keeping her skin moist, helping regulate her oxygen intake and developing a formula suited to a baby hippo's needs. The last of these was a process of trial, error and discovery. "There isn't a pre-made hippo mix," Rice said. "There isn't, like, a powdered mix that you just add water to that's perfect." The process involved milking Bibi and sending a sample to the Smithsonian for analysis. Once caregivers knew the nutrient make-up of hippo milk, they created a suitable substitute. One of the most alarming moments of Fiona's early life hit around the time of her anticipated due date. At 6 weeks old, she developed diarrhea, became dehydrated and began losing weight. Her vet team recognized her need for fluids and nutrition, but they couldn't get an IV to stay in place. Zoo staff called in nurses from the Vascular Access Team at Cincinnati Children's Hospital Medical Center. "I was a little doubtful walking in," Vascular Access Team nurse Darcy Doellman said. "She was laying down on blankets -- it was really warm in there. She wasn't moving. She was on oxygen." Yet with the help of an ultrasound machine, she and fellow Vascular Access Team member Blake Gustafson placed an IV that stayed put. That IV provided the fluids and nutrition Fiona needed to get back on track. Since that turning point, Fiona's caretakers have celebrated numerous milestones. She was taken off oxygen in mid-March. Around the same time, she got an early taste of solid food with some hay pre-chewed by her mother. Much like a human child, she also showed signs of development in her self-discovery. When she moved to a bigger bedroom with a mirror in March, she enjoyed her reflection so much she tried to give it a kiss. Zookeepers weren't the only ones rooting for her. Her story, that cute face and that sassy attitude helped her grow a worldwide fanbase. From taking her off oxygen to navigating pools of various depths, fans have been following her story in the news and on social media. Eventually, Fiona was ready for one of her biggest milestones of all -- interacting with her parents. Her caregivers' anxiety melted into relief when Fiona began bonding almost immediately with the mother from whom she'd been separated since birth. Henry wasn't initially as receptive, but after a few days he warmed to Fiona and even spent 10 minutes holding his mouth open for her to investigate. 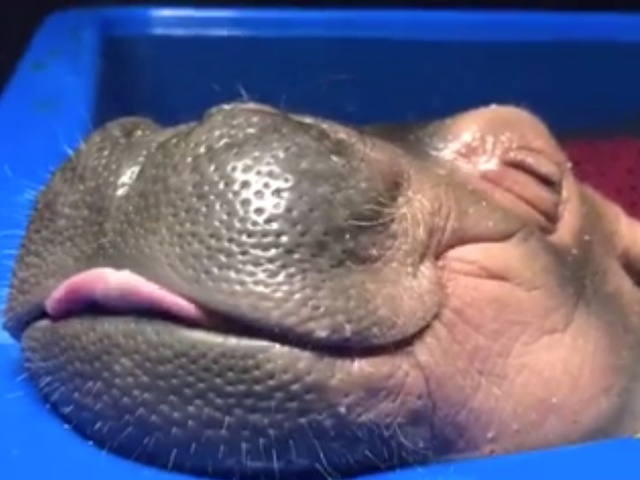 "That was one of the best days because not only are they OK together, but they could be happy together," Rice said "At the end of the day, that's all we ever wanted was for her to have a happy, healthy life with other hippos."